Salsa Engage has given Faith in Texas the ability to inform their supporters on advocacy work & community organizing. 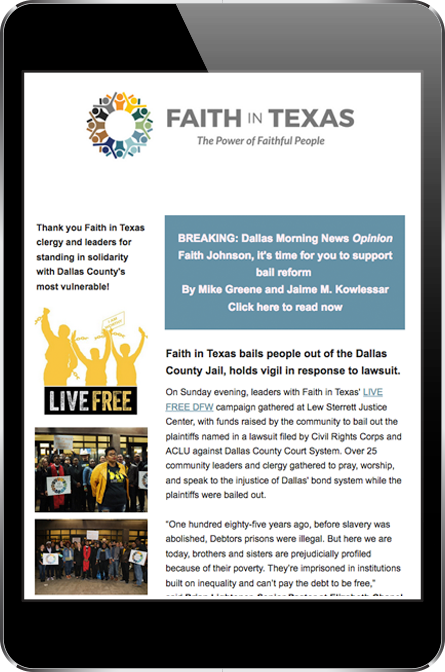 Faith in Texas is a multi-racial, multi-faith movement developing civic leadership in faith communities for economic & racial justice. They have continued to bring new voices into Texas for the past 3 years. 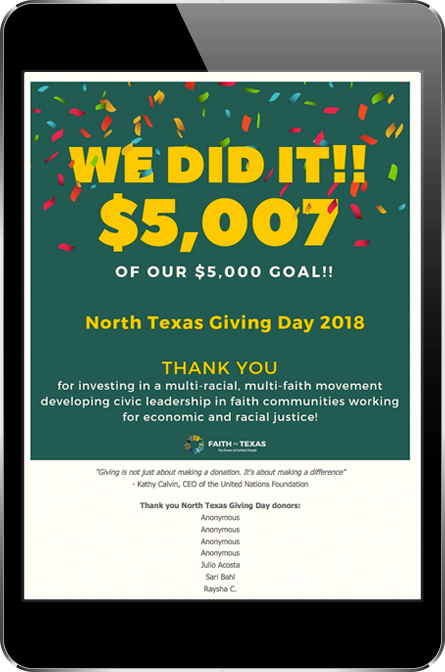 With a 2018 forecast made up of events, meetings, new messages, and registrations, Faith in Texas knew that their current software (EveryAction) just wasn't going to cut it. "EveryAction just served a purpose - the purpose of communications. They didn't have layouts, templates or a way to easily build forms. And as far as customizing constituent records it was the bare minimum, we weren't even able to add complex notes!" said Akilah Wallace, Director of Development at Faith in Texas. After extensive research, Faith in Texas decided to start the new year off right with Salsa Engage. "Even before purchasing Salsa Engage and CRM, I was really impressed with the functionality and the possibilities of what we could accomplish," Wallace mentioned. 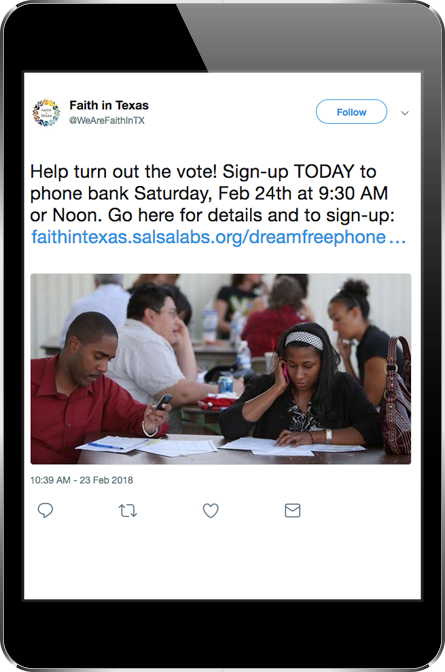 Salsa Engage has given Faith in Texas the ability to inform their supporters on advocacy work & community organizing through various options including targeted actions, emails, custom event pages, and sign up forms. "Engage has been absolutely wonderful! We love the ease of creating a form or email and how simple it is to give it the look we want. It's so helpful to be able to track our donations and review the results all in one place," Wallace said. Salsa has not only provided Faith in Texas with more ways to spread their message, but it has also saved them time. "When using EveryAction a lot of the work was manual and we struggled with certain functions, but with Salsa, a majority of it is already set up for you and can be customized to fit your liking. Salsa has made everything easier," stated Wallace.